Vehicles sit in high floodwater during a storm surge associated with Superstorm Sandy in 2012, near the Brooklyn-Battery Tunnel in New York. The city has agreed to reimburse the federal government $5.3 million for its false claims, according to the settlement proposed Wednesday. City officials who certified that the vehicles were damaged during Sandy either knew they were making false statements or did so "with reckless disregard or willful blindness as to their truth," U.S. Attorney for the Southern District of New York Geoffrey Berman said in a complaint accompanying the proposed settlement. "When people lie to FEMA about the cause of property damage in order to reap a windfall, it compromises FEMA's ability to provide financial assistance to legitimate disaster victims in desperate need," Berman said in a statement. 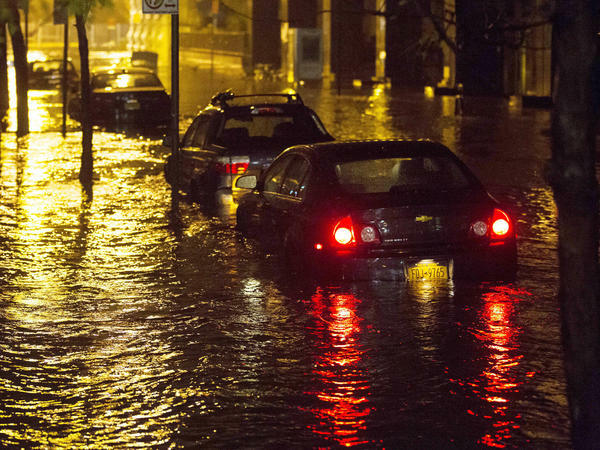 In examining the fleet, city employees "considered only whether a vehicle had sustained any damage during the storm, without regard to the condition of the vehicle prior to Sandy," the complaint said. As a result, "many of the vehicles that Fleet Services included on its 'final' list of Sandy-damaged vehicles had been non-operational — and some had even been marked for salvage — years before Sandy." In a statement, the DOT said it first learned of the problem in 2016, when a U.S. attorney alerted the department that its Sandy-related reimbursement claims were overly broad. The DOT tells NPR that it "cooperated fully" with an investigation and has since "instituted stronger procedures to reduce the risk of this ever happening again, including a new grants compliance officer and a centralized, comprehensive tracking system for the agency's thousands of fleet vehicles." But according to the settlement, a city employee first notified the city of ineligible claims in 2014. The deputy commissioner of DOT, who signed the certification stating Sandy caused the damage, was informed by the employee in a June 2014 email that some of those vehicles had been "junk for years." That employee said that DOT itself had told New York Police Department in 2009 that the paving machines had been "sitting under the highway in the dump for seven years and were being pick[ed] apart by vandals," the complaint said. Only after the city became aware of the U.S. Attorney's investigation did it amend its request, offering to return more than $3 million for seven paving vehicles it had erroneously included in its first reimbursement request, according to the settlement. "With so many New York residents impacted by Superstorm Sandy, it is critical to ensure every dollar of appropriated relief funds are properly used and accounted for," said Mark Tasky, special agent in charge of the U.S. Department of Homeland Security's Office of Inspector General, in a statement. NPR's Vanessa Romo contributed to this report.